Bath time with your best friend gets so much more comfortable for you with this thickly-padded kneeler. It’s the perfect protection for your knees while you scrub and rinse. 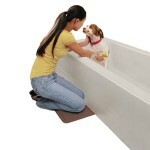 An added bonus is the slip-resistant base that provides you with staying power for those times when your pup tries to squirm and leap out of the tub before you’re done. Neither rain, nor sleet, nor snow shall linger in your dog’s coat after a quick rub down with these super-absorbent mitts. Simply slip the pair on and massage your dog’s fur to remove excess rain drops, puddle slops or bath bubbles easily and quickly. 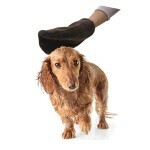 You’ll love how fast they dry and your best friend will love the Shiatsu-like treatment! 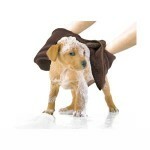 Ultra-absorbent, super-soft and quick-to-dry, this is the perfect après bath accessory for your pooch. 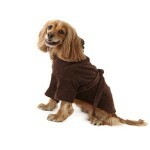 The Microdry fabric begins drying on contact and absorbs water 2x faster than traditional cotton terry robes. The hood offers head and ear warmth and simply looks adorable. Goes on easy with a Velcro closure and features a belt for customizing the fit.